Premier Doug Ford announced Thursday that Ontario will intervene in support of Saskatchewan's court reference case, challenging the federal government's right to impose a carbon tax on provinces that don't comply with its climate change plan. Saskatchewan Premier Scott Moe has been trying to find allies in his fight against Justin Trudeau's Liberal government's climate change policies. Ford said their new alliance will "send a clear message." To meet Canada's international commitments, the federal government has threatened to bring in a carbon tax in any province that doesn't implement an effective form of carbon pricing to reduce its emissions. Saskatchewan launched a reference case at its Court of Appeal, questioning the federal government's jurisdiction to do that. The two premiers met and enjoyed a campfire together on Wednesday evening, after arriving in Saint Andrews, N.B. for two days of Council of the Federation talks. Ford said they were on "the exact same page," vowing to "use every tool at our disposal" and rally opposition to carbon pricing among their provincial and territorial colleagues. Moe called carbon taxes "an ineffective policy that simply does not reduce emissions," saying it moves jobs and opportunities to other parts of the world instead. Ottawa's plan fails to recognize the diversity of the Canadian economy, he said. "We have two provinces in compliance, we have two provinces in court and we have the rest of the country not meeting the federal carbon tax backstop," Moe said. It's not clear which two provinces Moe is referring to as being in compliance. The deadline for provinces to have their plans in place is in September. Alberta and B.C. already have a carbon tax. Quebec and Ontario chose a different way to reduce carbon emissions: participating in a "cap and trade" carbon market where polluters purchase credits, offering a financial incentive to use clean technology. Under Ford's leadership, Ontario will pull out of the carbon market, leaving the province's businesses to wonder what will happen to several billion dollars worth of carbon credits they'd already purchased. The premiers of both B.C. and Quebec spoke out in favour of carbon pricing Thursday. "The carbon tax has not had the negative impact on our economy that others fear," B.C. 's John Horgan said, saying people should look at his booming economy as evidence of the advantage B.C. had in being an early adherent to taxing pollution. Couillard said he likes the idea of carbon markets better than carbon taxes, and he doesn't share Ford's view that they don't work. "We are in Quebec a living example of the fact that you can have co-existing carbon pricing and strong economic development. We have record levels of growth," he said. Reached in Hamilton, Ont., Thursday, federal Environment Minister Catherine McKenna called the Ford government's recent actions "sad," saying that cutting programs that fund the green technologies that reduce emissions won't save people money. "It's lose-lose: on the environment, lose on the economy," she said. Nevertheless, the federal government is moving forward, she said. "Our government is all in on climate action." Manitoba was reluctant to sign on to the federal government's plan until recently. It sought a legal opinion on the federal government's jurisdiction, but did not go as far as Saskatchewan has in initiating a court reference. The legal advice said the federal government has the jurisdictional authority to impose a carbon tax, but also suggested that if a province had an alternative plan that would accomplish the same policy goal, it may succeed in arguing Ottawa does not have the right to interfere with its preferred mechanism to reduce carbon emissions. This view has not been tested in court. New Brunswick Premier Brian Gallant, the chair and host of this year's summer gathering of premiers, said he was monitoring Saskatchewan's case to see what will happen, but "what we're told is that the province's case will not stand up. That is the advice that we have been hearing." Gallant's government has an emissions reduction plan, but it's been criticized as inadequate by the federal government. The premier said that McKenna "has more challenges with other provinces." "I would respectfully suggest to her that she focus on that," he said. Will others follow Ford and Moe's lead? A federal carbon tax was supposed to be a last resort, imposed only if a province didn't implement adequate policies of its own. Other provinces are wrestling with different climate change strategies that may or may not result in enough reductions to meet Canada's national goals. Ford and Moe are trying to stir up dissent, but no one else has joined their fight, yet. Alberta Premier Rachel Notley's opponents in next year's provincial election, Jason Kenney and his United Conservative Party, strongly oppose the carbon tax Alberta's New Democrats brought in and would likely side with Ontario and Saskatchewan if elected. Atlantic provinces have also found it challenging to satisfy the federal government's requirements in ways their voters will accept. "Every province will do what works for them," said Nova Scotia Premier Stephen McNeil, whose province is developing its own internal cap and trade system. When asked Wednesday about his province's recent objections to the implementation of a carbon tax, P.E.I. Premier Wade MacLauchlan said his province remains a full signatory to the federal government's deal, but his province's approach will be to lower the price of renewable energy to motivate people to do the right thing. "People are acting and voting with their feet, and that's what I think our climate change commitments are all about," he said. Ford was not with MacLachlan and the other premiers Wednesday in Bouctouche, where they met with Indigenous leaders. Instead, most of the media caught their first look at Ford striding across the lawn in front of the Algonquin Resort chatting away with Moe ahead of the premiers' official group photo that evening. 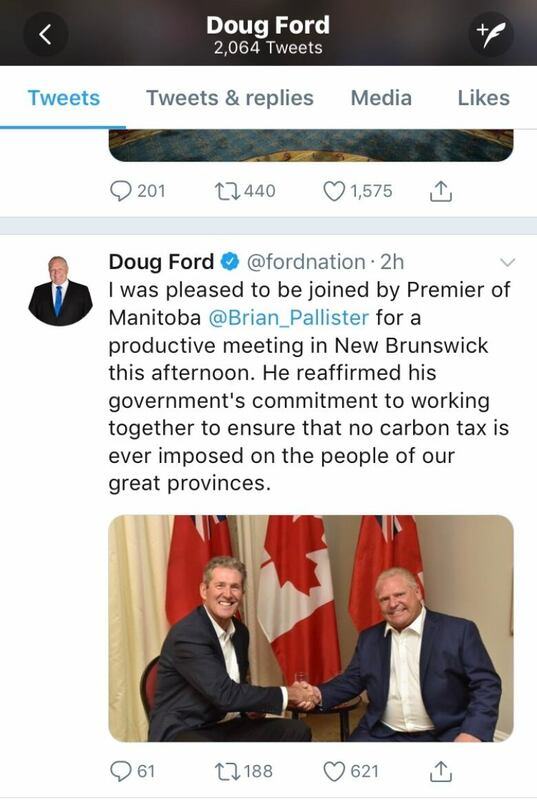 On social media, Ford began publicizing his side meetings with premiers who have opposed the federal government's climate change strategy: first Manitoba Premier Brian Pallister, and then Moe. Gallant hosted a cordial dinner for all the premiers on Wednesday evening to kick off informal discussion on trade issues. Following the dinner, which ran late, media were invited to photograph Moe and Ford meeting one on one. "He's a great guy," Ford said of Moe, in front of the cameras. "I've got a lot to learn from him." Ford was forced to change what he said on Twitter about his meeting with Pallister. 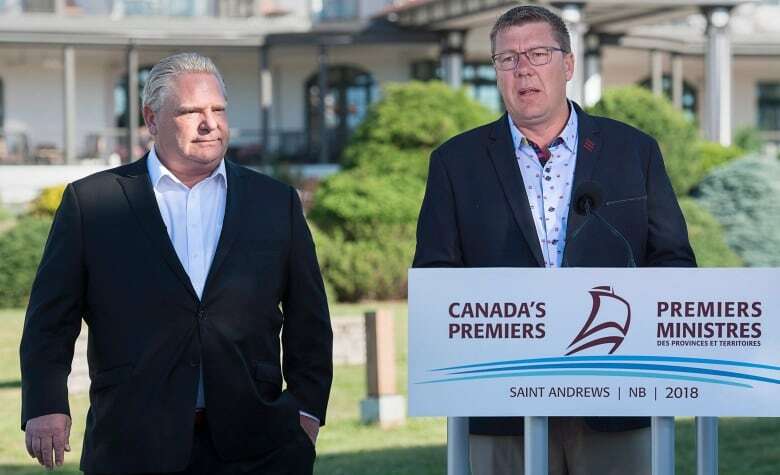 The Ontario premier tweeted that when the two met, Manitoba's premier "reaffirmed his government's commitment to working together to ensure that no carbon tax is ever imposed on the people of our great provinces." But the Manitoba premier's staff were quick to tell CBC News that in fact Manitoba has put a price on carbon. Ford's tweet was then changed to say the pair discussed "shared priorities for our country." Manitoba and Saskatchewan were both reluctant to agree to the terms of the federal government's strategy, but Manitoba eventually relented rather than lose federal funding for emissions reductions programs. In an interview with CBC News Network on Thursday morning, Pallister said he didn't object to other issues like carbon pricing being raised at this week's meeting, but if the premiers don't focus on a single priority — he wants to talk about interprovincial trade — the meeting will end up with "just talk." 7 things to watch as Canada's premiers gather in N.B.